1234567890 - nope, it's not the new magic number from Lost. 1234567890 is, in fact, a timestamp we're fast approaching on the Unix clock. Unix has been counting seconds ever since it first came to life back in January 1, 1970 at midnight UTC. Well, okay, that's not the exact date when Unix was born but you get the idea. This is the count up from the start. We'll reach the 1234567890 second mark on Friday the 13th at 11:31:30pm UTC. 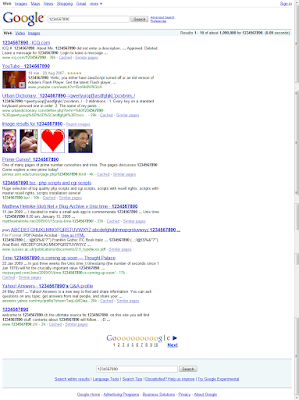 I yoinked the phrase 'Super Digg' from Ryan Durk when he took advantage of Google commemorating Jan 1 TCP/IP day. You can read an excellent write up of that here at SEO Book. Simply put; Google changed their logo to mark the day, clicking on the logo was a click through to a non-competitive search set. Durk grabbed a blogpost sub-domain, rode the wave and made 300k hits in 24 hours. The post is worth reading for a lot of reasons. He talks about better ways to make money from the 'Super Digg'. Do you think Google is likely to celebrate the 1234567890 timestamp in the same way? I think it's more likely than unlikely. The search 01234567890, if Google chooses to mark the day, will be a little harder. The search results for this quirky keyword are already fairly complex. There are also some serious players in the 1234567890 space. I kid you not. Firstly there's the rather cool Epoch Countdown(countup). You watch - people will tweet about this one. Secondly there's even a 1234567890 Swiss website that claims to be the ultimate source for everything 1234567890. Update: Google came good. That's where the 1234567890 day logo in the top right of this post comes from. The logo didn't last the entire Friday the 13th, though. Gmail's tasks reminder is a pain. Matt Cutts, Google Japan and a PageRank penality?